Voice search has been making strides in the recent years and we’re not surprised. After all, it is a more convenient way for customers to find what they’re looking for online. Not to mention, it’s way quicker to ask your phone for an answer than it is to type it out. The more important question now is: have you incorporated voice search optimization into your SEO strategy yet? If the answer is no, don’t wait any longer. According to ComScore, by 2020 50% of all queries are expected to be voice searches. More interestingly, 30% of searches will take place without a screen. As a business owner or marketer, you probably wonder now what are the best ways to master voice search optimization this year? We have the answer. Focus on Question Phrases – Surely, voice queries contain conversational words and are longer but that doesn’t mean you need to use long-tail keywords in your content. Instead, think how your audience speaks about your business, products, and services to come up with the best keyword strategy. Answer the Public – Not sure what questions people are asking regarding your industry? Answer the Public is a great resource to use when working on your copy. Just make sure you’re including the question and the answer in your blog posts or company listings. Claim your Google My Business Listing – If you’re trying to target local customers, you need to make sure they can find you first. For example, when someone uses voice search to find an “ad agency in Delaware”, hopefully your business will come up thanks to the keyword strategy you have in place. However, if a potential customer wants to find ”ad agency near me”, this is where your claimed Google My Business listing can help. Make sure your business is up to date with correct address, contact info, open hours and website link to get the most out of local SEO benefits. Be Mobile-Friendly – Let’s be honest, attention spans are only getting shorter these days. Time to make sure your website is up to speed! Being mobile-friendly also includes easy navigation and clear web design. To check how your website is performing on mobile devices, you can use Google’s Mobile-Friendly Test Tool. Focus on Featured Snippets – You know those highlighted points on top of your search page? This is where you should aim to appear! This so-called “position zero” is a prime real estate for voice search. While there’s no definite answer on how to get there, you can certainly help it with your conversational tone and relevance of copy. This is why it’s so important to know what people are looking for! Remember to utilize Answer the Public platform when creating your content or working on your Google listing bio. Need help with voice search optimization? Contact Advertising Is Simple! 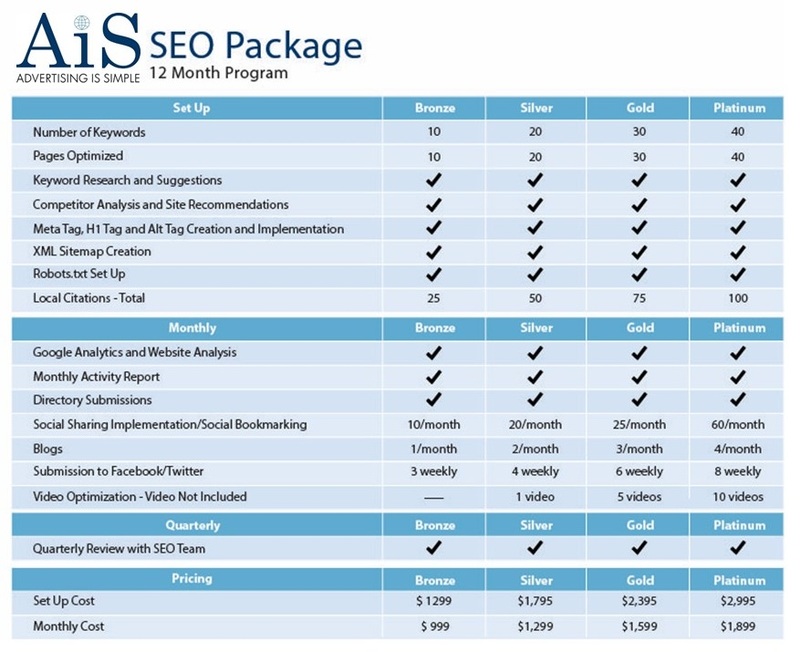 Our mission is to increase our clientele’s brand online exposure through the use of proven SEO techniques and unparalleled customer service in order to create a greater ROI. We are particularly vested in search engine optimization, mobile website design, and original content management in order to help our clientele claim their share of the marketplace. Does Your Business Need to Invest in Competitive Analysis? Here’s the answer. Imagine this. It’s a new year and you are a small business owner. You are committed to taking your business to the next level and trying new marketing tools to achieve your goals. However, you are unsure of how much you should be spending. Should you run the risk of spending too little, causing yourself to be overpowered by your competitors with larger marketing budgets? Or what about the risk of overspending and a possibility of losing your leads to those who are quicker than you? This is where competitive analysis comes to play. There is no exact science to what your business should be spending on marketing/ advertising, but through a thorough competitive analysis, you’ll have a good starting point. You may be wondering what exactly is a competitive analysis? In short, it is a report that is a compilation of what your competitors are doing online. Such research outlines their strengths and weaknesses, but most importantly, the opportunities and potential your business has to be successful in the digital realm. If you’re still wondering whether your business needs to invest in a competitive analysis in 2019, here’s another good reason. Unless your competitors employ a dark web wizard who is able to hide all of their online actions (which I guarantee they do not), they are leaving a small digital footprint from which we are able to draw and interpret data from. We are also able to compile estimated search volume and bid prices for specific keywords on major search engines. Not to mention, generate an intelligent estimate as to what your competitors are spending on a monthly basis for certain keywords. Are you wondering how this helps you? Well, with this data we are able to guide your marketing investment decision based upon what available marketing dollars you have. More simply put, we consider your available budget and suggest the route that is most beneficial for your business. This saves your business from failures such as getting caught in the middle of an unwinnable pay-per-click war with a competitor with a substantially larger marketing budget than you. Ready to invest in your future? Advertising Is Simple is proud to offer a competitive analysis from now until 1/31/18 at half the cost! For $495, we will put forth our proven and tested practices towards giving your business the competitive edge it needs to take the next step in 2019. With Thanksgiving only about a month away, now is the time to get your holiday marketing strategies in place. Don’t know where to start? Think of ways to connect with your customers emotionally and tap into the spirit of giving back. If your goal is to increase conversion this busy holiday shopping season, we got you covered. Here are 8 holiday marketing strategies that will maximize your advertising efforts. Offer Special Deals – Reward your best customers for their loyalty throughout the year by giving exclusive discounts or personal gift based on their purchase history. Create Holiday Landing Pages – Create holiday landing pages that you can send customers to from your social media and emails campaigns. Be sure to have several different designs and do some split testing to determine the highest converting pages. Start a Social Media Campaign – Use holiday specific images, hashtags and special offers to attract customers willing to spend. This is the time when they are starting to search for deals! Encouraging social media interaction will also get people in the holiday spirit of shopping. Focus on an Email Campaign – Use email more often to get customers excited about upcoming deals. Make sure to triple your marketing efforts on Black Friday and Cyber Monday. Offer a contest, game or countdown to get more engagement. Don’t forget to add a popup subscribe form to your website and welcome new email subscribers with a discount code as well. Focus on High Sales Days – Take advantage of the highest selling days of the season. Offer special promotions for Black Friday, Small Business Saturday and Cyber Monday. Give Back to the Community – Show support to the community by sponsoring a food drive or collecting clothing and toys for needy families. Many of your customers are looking for ways to make the season more meaningful by sharing with those less fortunate. Send out Holiday Cards – Let your customers know how much you appreciate their business by sending out a holiday card with a personalized special offer just for them. For example, if Customer A repeatedly purchases a certain product or service, provide them with a coupon for that particular item. Continue to send out cards that may invite them to a special event, sale, discounts or free gift promotion. Create a Holiday Video – Get your team together for a fun and inviting holiday video. There’s nothing more personal than sending good wishes to your customers and showing your fun personality at the same time! One of the most powerful and cost-effective marketing tools for your business are client testimonials. Why? Because they deliver value from the people that know your services or products best. If you’re wondering how to ask your clients to provide feedback about your work, we have great ideas that bring quick results. Check them out below! Ask Immediately – Timing is everything! You should reach out right after completing a project for your client. If they’re happy with your service, they will surely want to share feedback with you right away. Create a Review Sheet – Create your own document to solicit review on your Google My Business, Facebook and Yelp business listing to encourage your clients to leave reviews. Have the links go directly to your reviews page. Make it Easy – It’s important to provide simple ways for your clients to leave a testimonial. Whether it’s linking a specific page you want your reviews on in the initial email request or bringing a camera to the meeting for a video testimonial, make sure it’s all clear to follow! Ask the Right Questions – This is especially important if you’re asking your clients to provide a video testimonial. Having a set of questions to answer by your clients will help you get the information you need fast and efficiently. Not to mention, it will be much easier for your clients to provide specific feedback! Offer Different Ways to Provide Testimonials – If your clients are not comfortable with providing a review in front of a camera, ask them for a written testimonial. Also, determine whether you need more feedback left on your Business Facebook Page, Google Listing or any other local directory. Make sure your clients know how to leave a review on each platform! Look Out for Testimonials – Sometimes you don’t even have to ask for reviews. If you received a complimentary email from your clients or they left a great comment about your work/ products on social media, ask them if you can share it on your website. Just remember to put all screenshots in a separate folder to keep it organized before sharing. Create a Testimonials Page – Encourage your clients to provide a video testimonial so you can share it on your website. It will help your business with ranking higher in search, which equals to capturing more leads in the future. Use an Automated Service – There are certain platforms that will do the work for you. Just set up an account and customize your review request to start gathering those reviews. Customer Lobby is a great place to start. What’s your most effective way for getting client testimonials? Advertising Is Simple is a full-service marketing agency located in Wilmington, Delaware helping small to mid-sized businesses with all their digital marketing, radio and television advertising needs. Call us now. Is Your Website on Par with Legal Compliance and User Trust? So far, 2018 has been a big year for enforcing legal compliance (GDPR) and user trust (HTTPS), which are both critical elements to running your business online these days. The important question to ask now is: When was the last time you updated your website? If lately you’ve been noticing less traffic and conversions, it’s time to make changes. Without these important updates to your website’s functionality, you’re doing your own business a disservice. Here’s what you need to take care of immediately. The sooner you get your business GDPR compliant the better. According to this regulation approved by the EU Parliament, any company in the world that stores or processes data of people who live in the European Union needs to be in compliance with GDPR by May 25th 2018. Otherwise, you might face hefty fines – up to $24million (20m Euros) or 4% of annual global turnover, whichever is higher. Now, how to get your business compliant with GDPR? First, assign someone on your team responsible for reading the provisions of the GDPR to fully understand the requirements and specific circumstances your business might be involved with. Then make sure all your employees are aware of the new laws. Next, you need to inform your online visitors of the cookies available on your website and give them a choice to opt in or out. Data security has been the top concern in 2018, and it all comes down to establishing and maintaining user trust. Google Chrome announced a lot of changes to their online functionalities, especially regarding old http websites. The question is: Have you implemented the SSL Certificate on your website yet? According to Go Daddy, a certificate serves as an electronic “passport” that establishes an online entity’s credentials when doing business on the Web. When an Internet user attempts to send confidential information to a Web server, the user’s browser accesses the server’s digital certificate and establishes a secure connection. In other words, if being authentic and making your customers feel well taken care of is your top priority, this update is crucial to running your business online. Trust, confidentiality, protection and better search (SEO) are some of the major benefits of upgrading your old http website to https. Need assistance with implementing all necessary changes to your website? Contact Advertising Is Simple today!